Earlier today, I was able to get front row seats to one of the most interesting religious rituals the Philippine country is known for: The Celebration of the Black Nazarene. As of 2013, the country has gone through so much pain. Natural calamities from earthquakes to typhoons that has killed millions of Filipinos, to the most excruciatingly painful realization of corruption in the farthest echelons of power are what still haunt the Filipino people even as the dawn of the New Year unfolds. The Filipino people are bruised, battered and beaten to a pulp. They are in search of hope. And hope is in the form of a wooden Mulatto colored statue they call Christ. They say, in order to get a feel of an event, you have to be there yourself. I did, because I was. The view is spectacularly disturbing from the place I am standing. As 12 million people wave their white towels in the air, some young women even climb on top of the Nazarene float just to touch and kiss the statue. The mood however is not as solemn as one would expect from such an occasion. There is music playing, there is dancing, and cheers all around. Prayers are thought to be sombre and heartfelt. But this? This was a different way of showing worship. It was still dark when we arrived at Luneta. 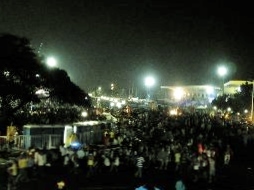 But even at 4AM, throngs of barefoot Filipinos marched towards the grandstand. By the sidewalk, you could see families huddled closely together trying to get some sleep. Women, children and even older people participate in this “pilgrimage”. 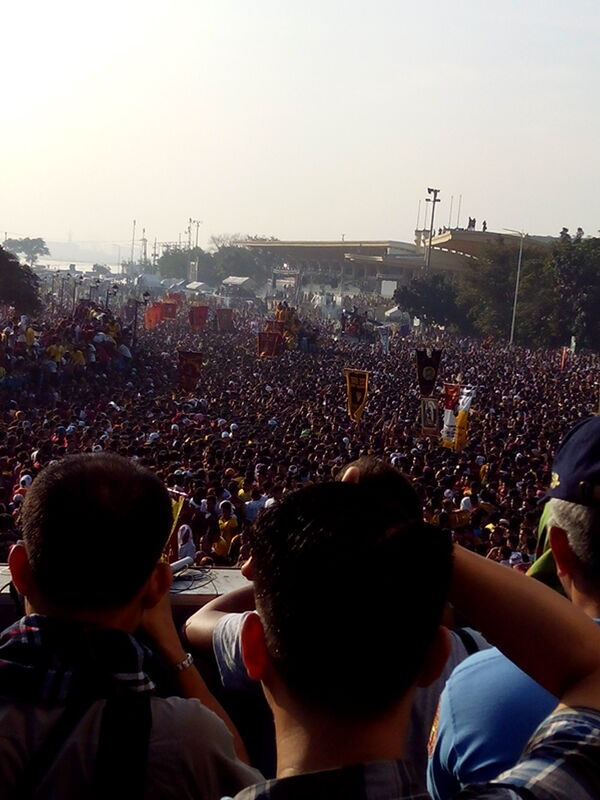 At just 4AM, barefoot men, women and children march to Luneta Grandstand to catch a glimpse of the Black Nazarene. You can sense a kind of desperation in the air. If people are in search of hope, why does it feel that they are celebrating? Are we confused as to what should be a time of prayer from what is merrymaking? I agree with fellow journalists when they said that some people are so dependent on religion that they refuse to take responsibility for the things they do or refuse to do in this life. Is this what they call faith or is it selfishness in its purest form? A view from the rooftop of the police station. A sea of red and white populate the grandstand. 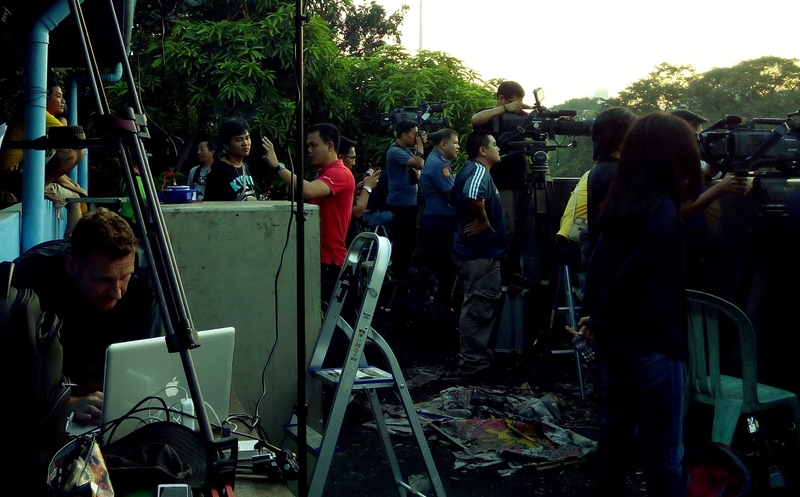 The rooftop from the police station serves as temporary headquarters for local and foreign journalists. With us, are some men in uniform who are told to man the media post. In this life, we are given talents, skills and gifts. If we refuse to use them or pass off the opportunity to utilize such, what better are we from the animals on the street who know not from right or wrong but merely to survive from day to day? I cannot write this piece without having to feel compassion for those that follow blindly. Hope is a good thing, but refusal to take responsibility and utter resignation is a whole other story. The Lord has given us discerning and powerful minds. Use it well. We are, after all, His greatest masterpiece. And no Mulatto colored statue, no matter how ancient it is, can substitute for a person who uses his mind to create a better world.